The oven (partial) you see is in the stages of disassembly for shipping. 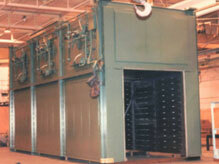 It is a (3) three zone, gas fired, BATCH TYPE AGING FURNACE with a lift door. This unit is capable of processing 100,000 lbs. of aluminum per hour. The customer also purchased a car, a pit mounted car drive system, and a remote operator interface with an Allen-Bradley touch screen. The oven effective workspace is approximately 33 feet long X 8 feet wide X 9 feet high. The oven itself is approximately 37 feet long X 15 feet wide X 23 feet high to the top of the door lift mechanisms. The entire system with oven, cart, track, and drive covers is approximately 86 feet long.